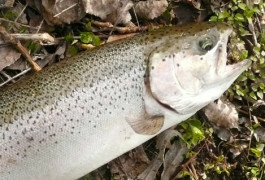 That is the question… There are so many baits and lures for steelhead fishing it can make an angler dizzy trying to decide what to use on a particular day. Roe, worms, flies, yarn, spinners, spoons, beads and the list goes on and on. Fishing with beads is a relatively recent technique although it is gaining popularity among steelhead anglers, and for good reason, they work! Bead fishing imitates a single egg pattern, it has long been known that steelhead love eating roe. The bead is pegged to the line approximately 2 inches above a small steelhead hook and drifted into pools, eddies and slack water where hungry trout await. Bead fishing is so effective that in many situations it out fishes conventional spawn sac presentations. 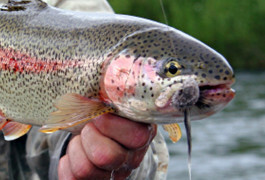 They are especially deadly when the trout are spooked and waters are low and clear. Bead colour choice is also critical for a successful outing, there are so many colours and patterns to choose from making the right decision is daunting at times. Although experienced anglers will chose more natural colours in clear low water conditions and brighter more fluorescent colours when the water is stained or murky. 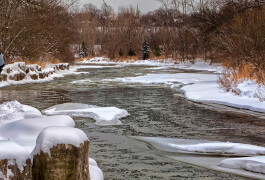 Bead colour choice can also be river, creek or stream specific. In some systems, orange toned beads are more productive, while in others, yellow or white toned beads are better. Also don’t under estimate the pink, purple and green hues, on specific days these colours can be deadly, and will produce fish, when nothing else is working. Bead size is also a determining factor between a good day on the river and a bad. The common sizes include 6 mm, 8 mm and 10 mm diameters. The smaller beads (6 and 8 mm) imitate trout spawn, whereas the 10 mm larger beads closely match salmon spawn. 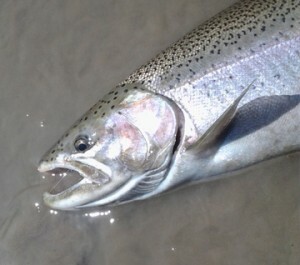 Depending on the season and what natural spawn forage is available in the river will determine the most productive size. Remember the fly fisherman’s code, “Match the Hatch”. This also applies to bead fishing. If you haven’t tried beads for steelhead, you are missing out, they can be very productive, and on days when fishing is tough, beads have proven to put fish on the bank. Check out our online assortment of proven fish catching steelhead beads, SHOP NOW, and happy fishing.